The first and only teammates to hit No. 300 back-to-back were Chicago White Sox sluggers Jermaine Dye and Paul Konerko (who currently leads the American League with 13-and-counting home runs in 2010 and has 339 career long balls). On April 13, 2009 the duo became the first MLB teammates to hit their 300th career home runs BACK-TO-BACK. This landmark achievement was something that no other power-hitting duo has ever done in the long history of major leagues. Not Yankees’ teammates Mickey Mantle and Roger Maris (who pushed each other to excel during the great home run chase of 1961). 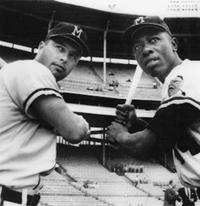 Not Braves’ teammates Hank Aaron and Eddie Mathews (who hit the most home runs as a duo - 869). Not Babe Ruth and Lou Gehrig (who drove in an avalanche of runs (2627 during their 13 years together). Dye led off the second inning of the game at Tigers’ Stadium by cranking a 2-1 pitch from Zach Miner over the wall in left-center field. Then, before his teammates even sat down in the dugout, Konerko smashed Miner’s full-count offering over the left field barrier to give Chicago a 2-0 lead enroute to a 10-4 win over their perennial rivals the Detroit Tigers. According to the Elias Sports Bureau, it's the first – and only – time teammates hit century milestone home runs of at least 300 in the same game. 300th HRs Back-To-Back – Part 2? Chicago’s Cubs teammates Derrek Lee and Alfonso Soriano could potentially become only the second teammates in MLB history to surpass the 300 HR landmark back-to-back (or at least in the same inning, since they rarely follow each other in the batting order). As of the writing of this article (May 27), both D. Lee and “Fonzie” were sitting at 299. Longtime California Angel Tim Salmon retired just one long ball shy of the 300 mark… something neither Lee nor Soriano plan to do. With prevailing winds sending so many baseballs out of the Friendly Confines and onto Waveland or Sheffield Avenues, Wrigley Field faithful could witness a historical redux sometime in early June 2010.